Chris Burke and I have completed a rotation up to our camp 3 at 6900m. 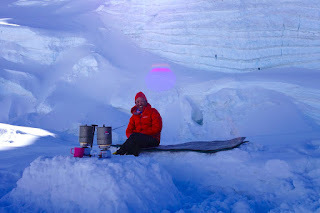 The whole trip took 6 days because of a few nights pinned down at camp 2 by high winds and heavy snow. 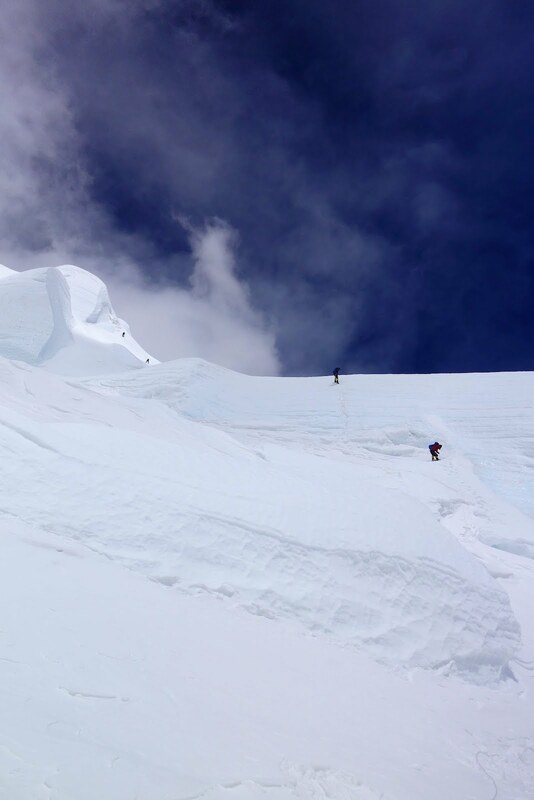 It is a bit of a gamble staying up that high for so long because the human body and immune system weaken pretty rapidly in the low oxygen environment but we felt strong and pushed through and now feel much more acclimatized. We also managed to cache most of our heavy gear and supplies at camp 3 in the processes so our summit push should start a bit easier. 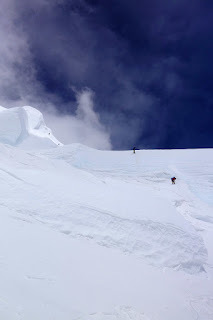 The route to camp 3 included a couple of exciting 1m+ crevasse jumps along the winding maze between even larger crevasses and one solid ice wall. We're not sure when our summit window will be as the current forecasts call for quite a bit of snow but we've heard that our neighbors to the west on Lotse and Everest are expecting a May 16th weather window. Kanchenjunga summits tend to be a few days behind Everest as the jetstream moves north. I'll report in as we learn more. The deli-copter made it in today in a small gap in the snow storm to pick up an injured Italian expedition cameraman and brought in supplies including fresh veg and toys! My lovely colleauges managed to deliver a pocket sized drone that is packed with acoustic and stereoscopic vision sensors and really cool computer vision systems to allow for amazingly stable, autonomous flight. Thanks to everyone who's contributed to OpenCV ARM, NEON and Mali optimizations. Aside from just being an amazing camera platform to shoot the beautiful rugged terrain with, it is also small and light enough to carry in a backpack and orders of magnitude less expensive than using a manned helicopter or tasking a satellite for updated images of the route. 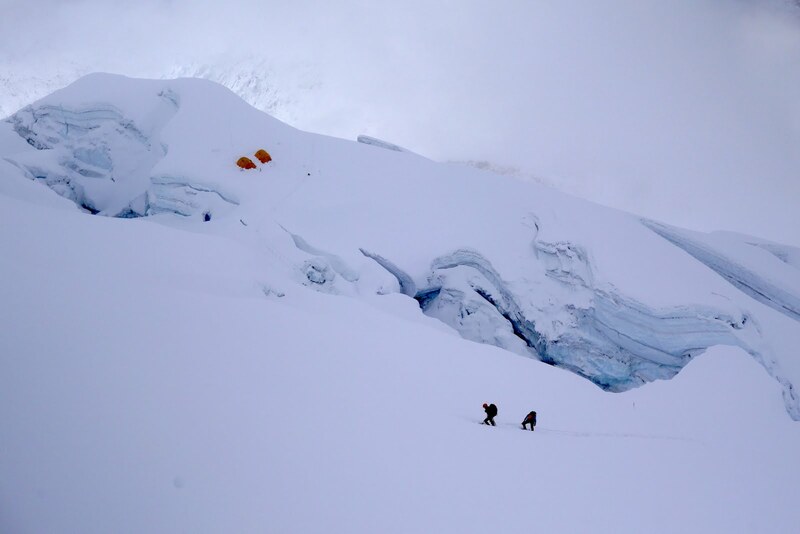 Those that remember our expedition on Annapurna last year might recall that we have a difficult time finding a route through the winding seracs, crevasses and towering ice blocks between camp 2 and 3. It took several dead-end attempts in the falls to find safe passage. 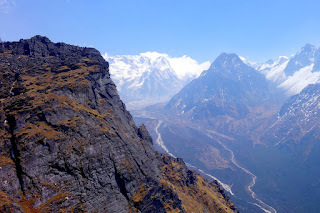 We even hiked up the mountain across from Annapurna with a telescope to see if we could spot a clean route from a distance. Our camp 3 is situated under a similar ice block (see photos below) and the trip up to camp 4 looks like it will involve descending in to a giant crevasse and climbing up the other side (Ascent of Rumdoodle style). I'm hoping to pre-scout some better lines in real time from relative safety behind my smart phone screen. This type of technology is already being used to inspect infrastructure from bridges to power lines to buildings, even deliver packages. I expect we'll see much more of this autonomous, inexpensive ARM powered technology doing everything from improving safety in dangerous environments to making and sharing art. Tonight is the full moon which means today is Buddha's birthday. We woke to several camps playing chants and all of the Sherpa are in high spirits today, playing card games, burning juniper and playing on the giant boulders around camp. It is a fun atmosphere with fresh snow on the ground and dozens of prayer flags criss-crossing our camp, floating on the wind. I celebrated by taking my first 'shower' in two weeks and doing laundry while it was snowing. Ahhh, the glamorous life of base camp. Lakpa building furniture and melting snow at our C1 just before the "down jacket" (first sunlight) hit our tents. Thanks to @ARMCommunity for the support and technology that drives my training, safety, communications and photography; all with a couple of tiny solar panels. I can't wait to get to an unmetered internet connection to share video and full res photos! Thanks Altitude-Seven.com for weather forecasting support and adventure inspiration. Thank you all, friends and family, for the kind electronic epistles of support, bits of news from the real world and overwhelming kindness. They are much needed, appreciated and entirely undeserved. Wednesday the 26th, our typical cacophony of avalanches every 20 minutes from the ice falls and mountains surrounding our little rocky safe haven at base camp has been overtaken by the low roar of the jet stream scraping across the surrounding 7000m peaks. Giant, shimmering spindrift plums soar overhead like fire as they catch the sun and sublimate. Its mornings like this that I'm happy to be at base camp with a coffee, a solar panel and a tablet. Others busy themselves moving big rocks to anchor tents in case the jet stream settles in lower and threatens our movie theater and disco tent. I've found the best way to keep my Outernet weather and news connection stable is to glue the antenna directly to a chunk of granite. Not that we actually care to read the news of the world outside of our little international community but if I don't work on keeping up comms, weather and charging all of my cameras, lights and beacons for the next rotation, I'd probably be writing poetry about the wonders of e6000 epoxy. 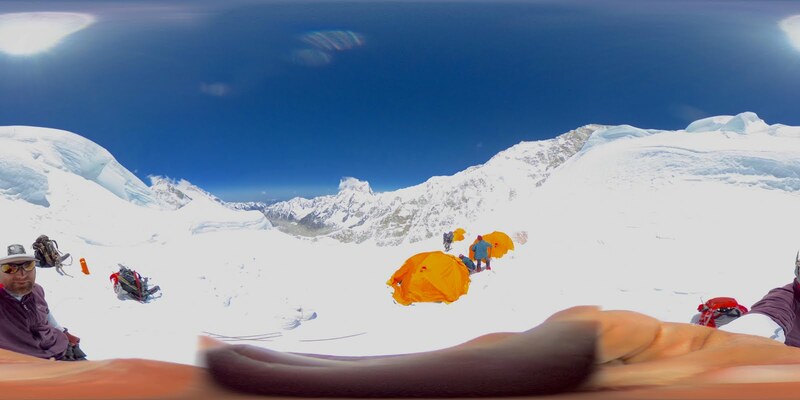 My small group (Chris, Chris, Lakpa, Tsering and I) made a short rotation up to camp 2-ish a few days ago. 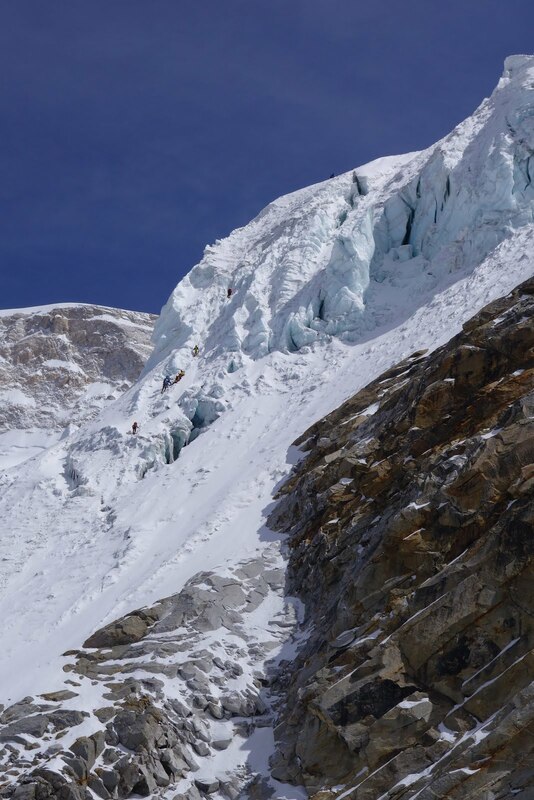 We carried a bunch of rope and pickets to the temporary C2 but are hoping to move that camp up a bit higher to avoid having a 1000m climbing day from C2 to C3 at 7,100m. One thousand vertical meters may not seem like a big climb if you were in our local Rockies or Sierra Nevada but at 7000m we're breathing half the oxygen you'd get and with enough gear on our backs, this turns in to an 8-9 hour slog. We're primed to go to and set up C3 on our next rotation when the winds allow, though. The winding route through the icefalls looks fairly straight forward from below at C2 but if conditions allow it, we'll try to put up a drone to get a bird's eye view and spot potential snow bridge and crevasse hazards. Famed Italian climber and heli pilot Simone Morro tried to fly a B3 up near camp 2 to take pictures to plan a route by but couldn't safely get high enough above the possible route. Not all of us are wealthy enough to have our own helicopters (yet). It is a treat to share coffee and stories with such a famous climber and someone who was close to Anatoli B.
I never dreamed I'd be back on another 8000m expedition just one year after Annapurna. I'm questioning my own sanity and motivations in life a bit but thankful for my coworkers, friends and family for not just tolerating my absence but supporting me with kind messages and my wacky ideas to improve our safety, enjoyment and connectedness. The chance to learn from some of the greatest climbers of our time and simply live in this environment is wonderful perspective. 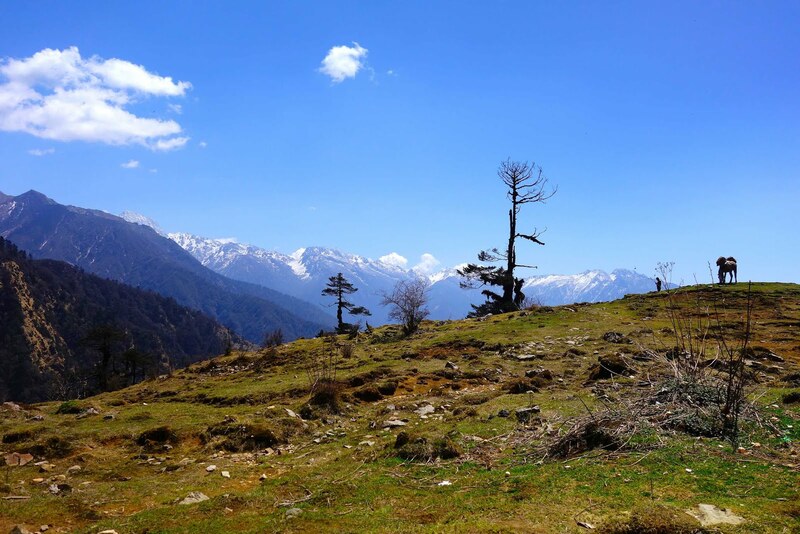 While I look forward to trading this monastary for a comfy couch with family or a meal with friends, I'll gladly soak up the night sky and type 2 fun high in the Himalayas. Lakpa and Chris as we carry a load above our tiny Camp 1 and a sea of clouds below. And yes, crossing that crevasse is tricky. Tsering and me taking a break on a snow dome just below a mixed climbing section. 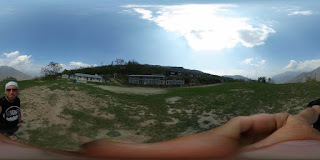 360° photo best viewed interactively in Google Photos, Facebook or VR. p.s. I have Jemaine Clement's "Shiny" (from Moana) stuck in my head. My only solace is that I can get it stuck in your head, too. Go ahead, youtube it. p.p.p.p.s. 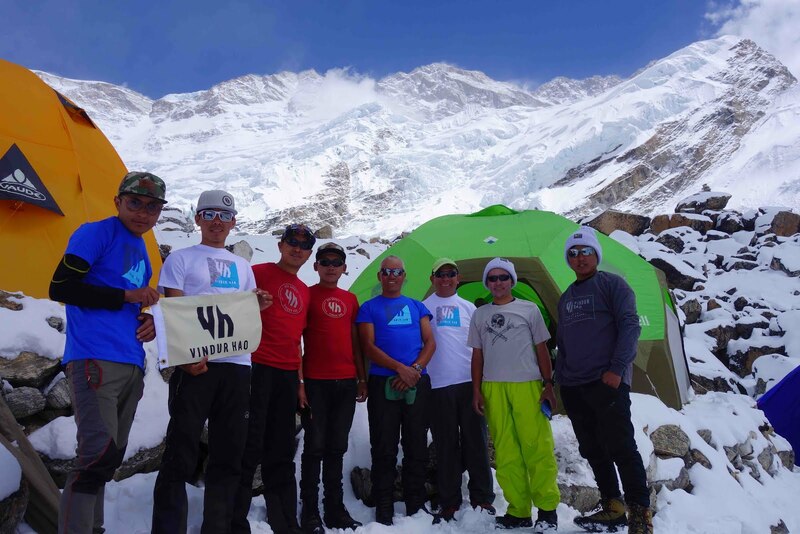 Thanks to our friends at Altitude-Seven.com, @ARMCommunity and @vindurhao for weather updates, threads and emotional support. After about 10 days of trekking we have arrived at our based camp at 5500m (18,000') high in the eastern Himalaya on the boarder with Bengali India. 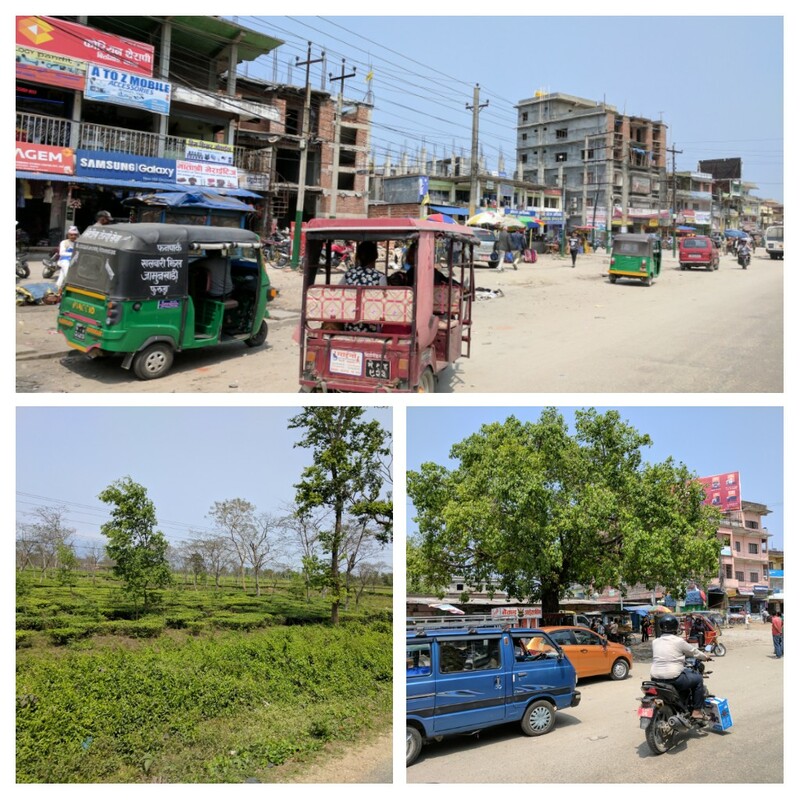 Our start in the flat planes near Bhadrapur brought us through tea farms, paper tree and bamboo jungles, several alpine passes and eventually, a stark, beautiful, glaciated valley. 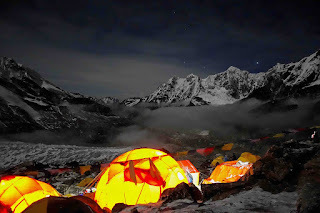 Our objective is now in sight from our base camp on the Southwest route of Kanchenjunga. Base camp is perched on a steep, high but relatively protected rocky ridge just to the side of an enormous icefall that is constantly grumbling and collapsing with enormous roars randomly throughout the day. Janu, a beautiful mountain, also looms large over us and sheds fresh snow every time Chris jokes about running up it to train. We were greeted with a foot of snow and an electrical storm the after night we set up our camp which suites us all fine as we'll need a few days to adapt to this very high basecamp before putting in a camp 1. April 17th is an auspicious day to hold a Puja ceremony so we won't open the route until after that anyway. We're fortunate to have two lamas with us, one of our kitchen staff, Chiri was a lama for a dozen years and climbing sherpa Chiriring for two years. We also have Pema and Ang Dorji joining us again and our favorite BC chef, Dome. Let the glamping begin. Chris Warner a former 8000m mountaineering guide, climbing gym entrepreneur, speaker and truly wonderful story teller. Chris and Chris are far more thoughtful, entertaining and skilled climbers than I am so I suggest following their blogs over mine if you plan to follow yet another quest for type 2 fun on the 3rd highest peak in the world. I'm sure watching these climbs unfold seems egotistical to some, repetitive to others but every adventure finds a lovely cast of characters, an opportunity to live very simply, new ways to test the mind and body, and see how many days in a row we can go without bathing. I feel so blessed to have adventured to the most remote corners of the world with inspiring and amazing people. Even more to have family and friends back home and around the world that keep encouraging and inspiring more adventures and sharing their cultures. Base camp is just starting to take shape. Simone, Tamara and their Italian team are already here. 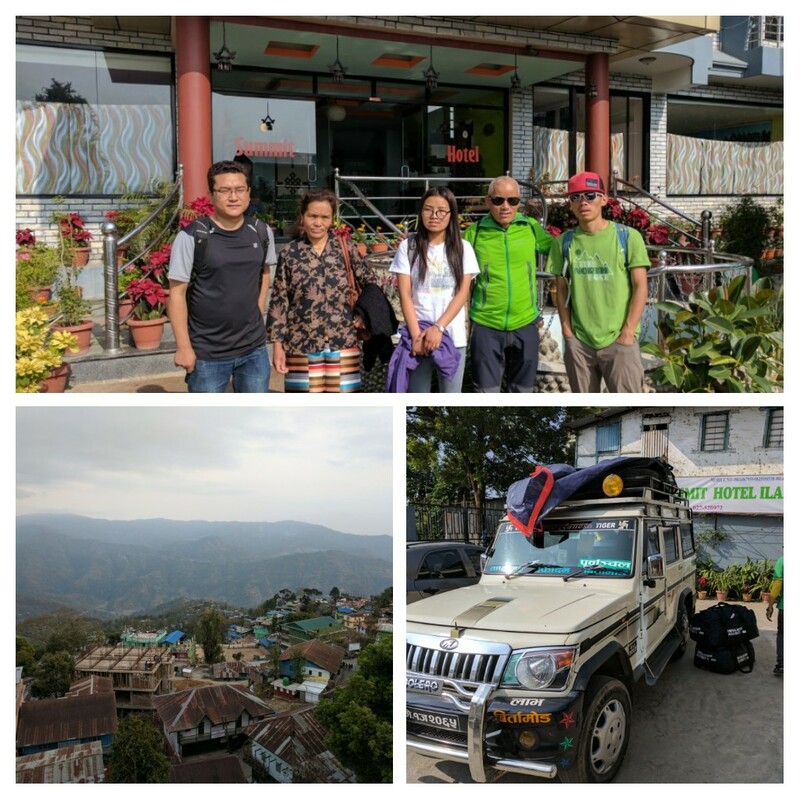 A Japanese & Korean expedition and international hodgepodge from the 7 Summits expedition, which includes the Sherpani, are a day or two behind us. We, of course, have arrived early to claim the high rent district that will save us a dozen meters when we start climbing. I'm not paid to mention any of this but I'm inspired and appreciate that my work and adventures overlap in fun and interesting ways and my colleagues put up with my extended periods of absence and get to see the stuff we help make in action. Simone already has a drone attempting to stagger around camp in the thin, snowy air as they film for their traverse of Kanch. 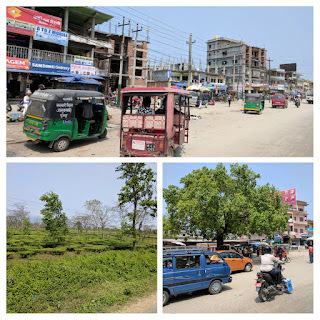 If I can get mine out of customs back in Kathmandu, I plan to survey the icefalls and glacier crossing above camp 1 and 2 before we even get there. I also have a neat, inexpensive, little "C.H.I.P." based prototype kit I've assembled to get us daily news, weather and wikipedia articles via free L-band satellite broadcasts. Our "outernet.is" is up and running at base camp and anyone with a wifi phone, tablet or laptop can connect to it and check the weather, news and books as long as this little computer, antenna, solar panel and battery survive the elements. I think this will prove to be a really neat, inexpensive educational product for less connected communities and schools when it is out of the amazingly fast prototype stage. It makes for a really cool project kit right now. My latest nerd crush, though, is this Android Wear 2.0 LG Sport watch; it is the best heart rate monitor I've used to date, music/podcast player, GPS, altimeter, and flashlight in one tiny device I've seen yet. It keeps me from being left alone with my own thoughts for extended periods of time, for which I'm sure everyone is grateful. And it tells time. Remember, devices get dropped, batteries die in the cold, we get caught up in keeping warm and staying safe; no news is good news. Thanks to @ARMCommunity for the support and technology that drives my training, safety, communications and photography. Also, thanks to @vindurhao, our sherpa and I love the gear. Who says you have to look like a dirtbag climber at base camp?